The best of ... 2014! 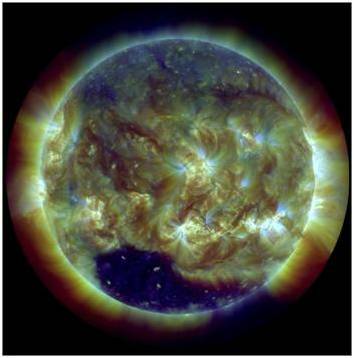 In its New Year's letter for 2014, the Sun promised great solar activity to come. True to its word, sunspot numbers reached a new monthly high in February 2014, probably indicating the maximum of the ongoing solar cycle. Throughout the year, this increased sunspot activity was accompanied by plenty of strong flares, big sunspot groups and geomagnetic unrest. A compilation of the most memorable moments of 2014 can be found underneath. Using Helioviewer, a MOVIE was created containing a few clips of each event. 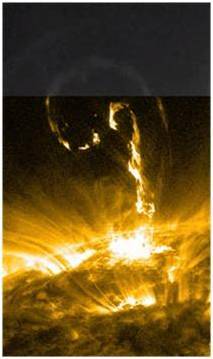 Usually, SDO-images were used, occasionally supplemented with imagery from STEREO, PROBA2, and SOHO. Happy reading, and the best wishes for a wonderful New Year! The new year started with one of the biggest sunspot groups of solar cycle 24 (SC24), up to that moment at least. NOAA 1944 had about 9 times the surface area of the Earth, and was quite flare productive too. On 7 January, it was the source of an X1 flare which was accompanied by a proton event that would reach 1030 pfu (particle flux units) two days later. This would become the strongest proton event of 2014, and the only strong solar radiation storm of the year (S3 - see the NOAA scales), but still 6 times less intense than the strongest event so far this solar cycle (8 March 2012). The ACE spacecraft recorded the highest near-Earth solar wind speed for 2014 on 13 January at 06:45UT, with maximum values of 903 km/s (5-minute average). The source of this high-speed stream is a huge trans-equatorial coronal hole (CH) that passed the central meridian on 9 January. According to HEK/Spoca, this CH reached its largest area on 11 January, measuring 188.400 Mm2, the equivalent of nearly 370 times the surface area of the Earth. The passing of the wind stream did not result in any geomagnetic storming, due to its mostly northward directed magnetic field. The strongest flare of 2014 took place in NOAA 1990 on 25 February. This active region was the third and last appearance of NOAA 1944. Though the region was still close to the southeast solar limb, the X4.9 flare was accompanied by a small proton event and a relatively fast asymmetric halo coronal mass ejection (CME). The shock from this CME caused a moderate geomagnetic storm on 27 February. A filament with a length of 1.5 times the Earth-Moon distance erupts on 4 June. 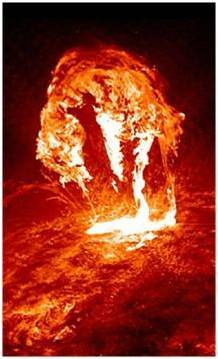 It is not associated to an obvious flare, but a very nice "canyon-of-fire" can be seen. 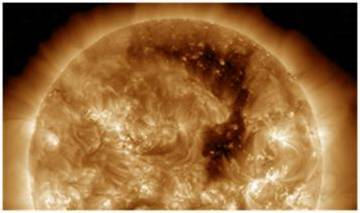 The associated CME will disturb Earth's geomagnetic field on 7 and 8 June, resulting in a moderate geomagnetic storm. Other geomagnetic storms reaching a similar intensity were the ones from 19 February and 12 September. On 10 and 11 June, NOAA 2087 released 3 X-class flares. In particular the first two are interesting, as the peaks of the X2 and X1 flare are separated by only 70 minutes. Also, the X2 flare lasts only 8 minutes, the shortest duration for any X-class flare in 2014. None of these is exceptional, as every solar cycle has had a few of these impulsive X-class flares. According to CACTus, the CME associated to the X1 flare was also one of the fastest in 2014, with a plane-of-the-sky speed of 1531 km/s. Confirmed by SILSO, 2014 had one spotless day, i.e. 17 July. 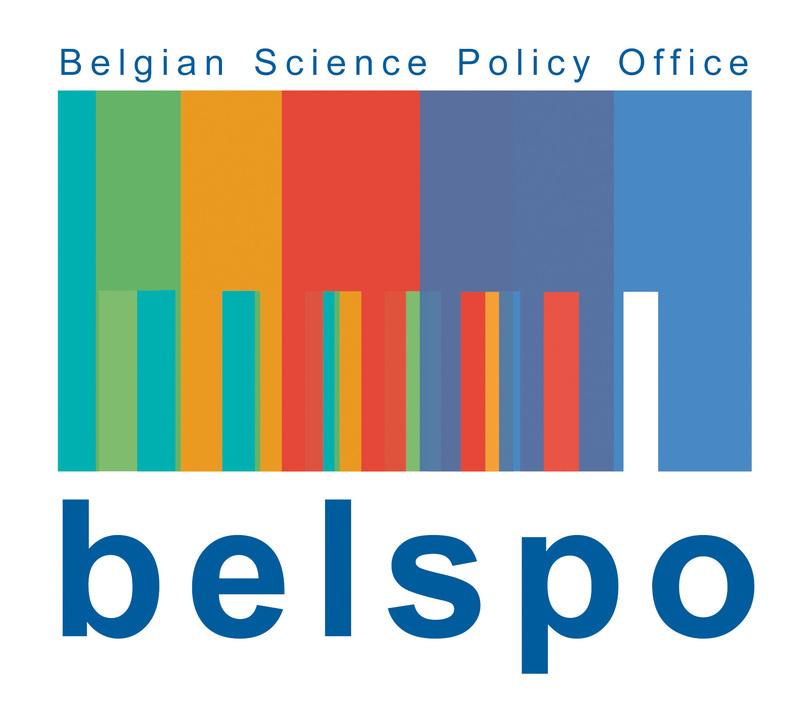 More important was the roller-coaster that the daily sunspot number (SN) displayed during this summer month: from values near 140 around 5 July to zero on 17 July, back to about 100 near the end of the month. 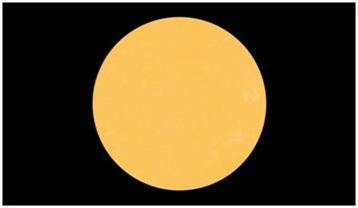 Both features (spotless day and the "roller-coaster") are not uncommon for maxima of weak to moderate solar cycles. 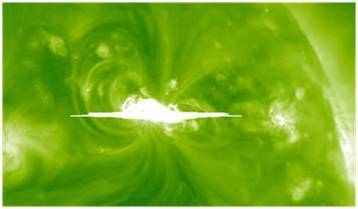 On 24 August, a relatively strong flare took place in a rather small sunspot group. Around noon that day, an M5.9 flare happened just to the west of NOAA 2151, a region consisting of a single, simple mature sunspot. The associated CME seemed to be tied to the solar surface at its four outer ends, giving it the outlook of a parachute. Amazingly, though most of the material was ejected into space, some of it reached heights of 4 solar radii before eventually falling back to the solar surface. On 1 September, STEREO-B observed a strong flare in an active region on the backside of the Sun, estimated to be a low-level X-class flare. The flare is associated to a strong proton flux increase. 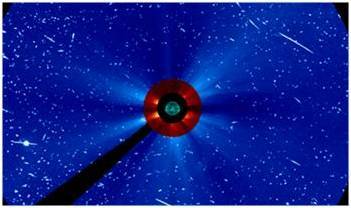 Amazingly, so many particles were slamming into STEREO-B's camera pixels (creating the white dots in the images) that they saturated the star-trackers onboard the spacecraft, making them lose lock on the Sun for about 4 hours. 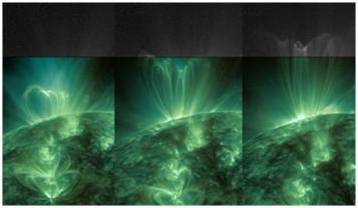 This resulted in a not correct orientation of the solar images. The large number of particles would also enhance proton fluxes as observed on Earth, for more than a week! NOAA 2158, responsible for the strong backside event on 1 September, produced a long duration M4 flare peaking early on 9 September, followed by an X1 flare on 10 September. Both are associated to halo CMEs, which arrive at Earth resp. late on 11 September and during the afternoon of 12 September. Initially, the magnetic field of the CME associated to the X1 flare is pointing southward (Bz = -18 nT), resulting in a major geomagnetic storm - probably the strongest of 2014. Then the field turns northward weakening the effects of the passing CME. So far this solar cycle, no extremely severe geomagnetic storm has been observed (Kp = 9). Active region NOAA 2192 is still 2 days behind the Sun's southeast limb, when it already produced a complex M2 flare on 14 October. Lasting 5 hours and 12 minutes, it will become one of the longest flaring events in 2014. Following this event, huge post-flare coronal loops develop and continue to grow outside SDO's field-of-view (FOV). PROBA2's wider FOV shows that the loops of this long duration arcade were visible for about 2.5 days (60 hours! ), and at their maximum height, they were towering at least 340.000 km above the solar surface. That's close to the average Earth-Moon distance! 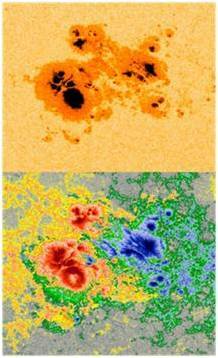 If anything, 2014 will especially be remembered for the giant sunspot group NOAA 2192. With an area of 16 times the surface area of the Earth, this group was the largest since NOAA 6368 in November 1990. It would produce 6 X- and 35 M-class flares during its transit, dwarfing flare activity from any other SC24 sunspot region (so far). Interestingly, no proton events and only one CME were associated to these flares. During its second transit as NOAA 2209, the group had simplified significantly and become much smaller, the main spot looking very much like a bear claw. It produced only 3 M-class flares. 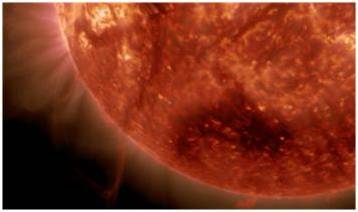 The coronal structure towering above the active region can be followed for more than 2 complete solar rotations. On All Saints day, a solid filament spectacularly erupted near the southeast limb. 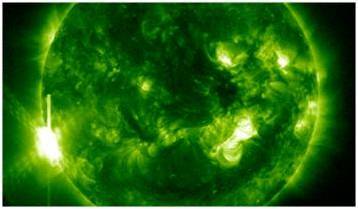 Far from any sunspot regions, this C2 Hyder flare ("spotless" flare) was associated to a large, but non-Earth directed CME. 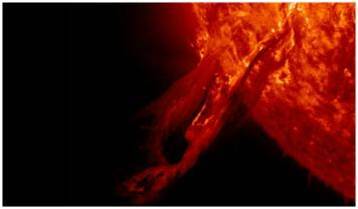 Particularly striking was the resemblance to another, more potent filament eruption that took place two years earlier, on 31 August 2012. 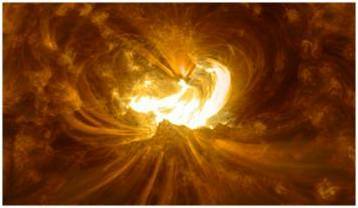 The largest coronal hole of the year appears near the Sun's south pole early December. It is so large that the total area of 650 Earths would be needed cover its surface. It extends from the south pole all the way to a latitude of about -30 degrees. That was close enough to the solar equator for its high speed wind stream to cause a minor geomagnetic storm on 7 December, with solar wind speeds up to around 800 km/s. For 6 consecutive days starting on 17 December, the pair of complex sunspot groups NOAA 2241/2242 produced a series of M-class flares culminating in an X1.8 flare on 20 December. The CMEs associated to the strongest of these flares have an Earth directed component, and their passing would result in a minor geomagnetic storm on 22 December. 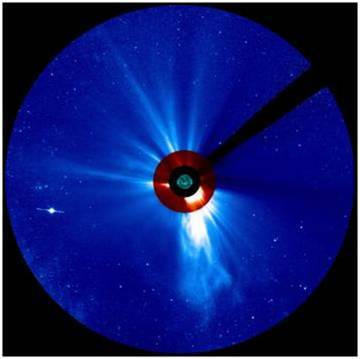 However, the succession of these Earth-directed CMEs also deflected the cosmic rays (high-energetic particles from outside our solar system), and neutron monitors (NM) recorded one of the largest drops in particles reaching Earth (6-8% - Oulu NM). This is a so-called Forbush decrease. The December event is similar in intensity than the one from 12-13 September, but of considerably longer duration. The strongest Forbush decrease so far this solar cycle occurred in March 2012 (10-12%). Ref: This just hot off the press!